4 BPI CEU’s have been approved for this course. The course will cover methods to test residential AC systems for their relative efficiency (both unit and total system efficiency) with out the need to attach pressure gauges to the refrigerant lines. 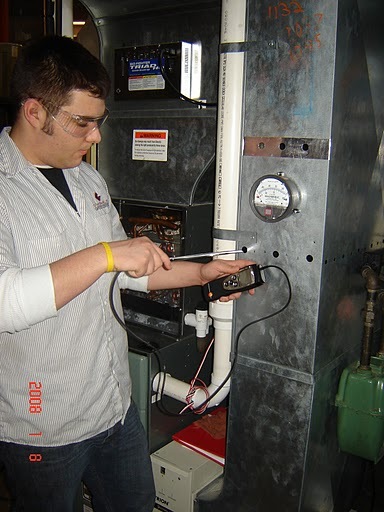 Using simple techniques, and some more complex, with a variety of tools, we will explore the options of testing system airflow, total external static pressure, and dry bulb and wet bulb temperature changes to determine if air conditioners are operating within normal parameters, or should be referred for service. The course will include both classroom training on the basics of the refrigeration cycle, airflow testing methods, and Enthalpy change, and will include hands on testing of an air conditioning system to measure airflow, and both sensible and latent heat change. Written Handouts from Tru Tech Tools(AC Performance worksheet, Enthalpy Tables, etc. ), will help provide the basis for our testing. Contact – Rhett Major to register – theenergydoctor@comcast.net or 724-863-5986!